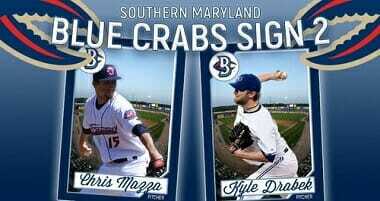 The Southern Maryland Blue Crabs have added two new pitchers to their 2018 roster, as MLB veteran Kyle Drabek and RHP Chris Mazza join the team for the second half of the season. Drabek will head to Southern Maryland in his 13th professional season, and second in the Atlantic League. The right-hander was originally a first round pick of the Philadelphia Phillies in 2006, quickly rising through organization’s ranks. After being named an All-Star in 2007 and 2009, Drabek was traded to the Toronto Blue Jays in a deal that sent Roy Halladay to Philladelphia. Drabek made his MLB debut the following season in Toronto, making three appearances for the Blue Jays that season. Over the next seven seasons, he would make 43 big league appearances between the Blue Jays, Chicago White Sox, and Arizona Diamondbacks. He then made his Atlantic League debut in the 2017 season, appearing in six games for the Sugar Land Skeeters on the season. Mazza will join the Blue Crabs in his seventh professional season, after beginning the year with the Miami Marlins AAA affiliate New Orleans Baby Cakes. The righty was a 27th round draft pick of the Minnesota Twins in the 2011 MLB Draft out of Menlo College. Mazza went 5-2 with a 2.05 ERA in 18 appearances during his first professional season, picking up a save on the season as well. After four seasons with the Twins organization, Mazza joined the Miami Marlins system in 2016. He made his first move to a starting role with the organization that year, making 30 appearances with 17 coming as starts. He remained in the role the following year, going 4-7 with a 3.01 ERA in 26 starts between AA and AAA.